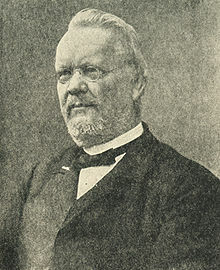 Karl Georg Friedrich Rudolf Leuckart was born on October 7, 1822 in Helmstedt, Lower Saxony, which would later become part of Germany. His father owned a printing plant and his uncle, Friedrich Sigismund Leuckart, was a professor of zoology. His uncle awakened the interest in zoology in his young nephew, who collected insects. Leuckart was interested in pursuing a career in zoology, but a the time there were no university programs devoted to it, so he was forced to study medicine, which he did at the University of Gottingen starting in 1842. At Gottingen Leuckart met zoologist Rudolf Wagner and became his assistant in 1845. Leuckart's dissertation, the same year, won a university prize. Leuckard became a zoology lecturer and in 1848 he went on his first expedition to the North Sea to study marine microorganisms. In 1850 Leuckart became professor of zoology at the University of Giessen. The years at Giessen were productive for Leuckart and he did a lot of the work studying parasites. He proved that cattle were the carrier of beef tape worm (Taenia saginata) and that pigs were the carriers of pork tapeworm (Taenia solium). Most vertebrate species have a tapeworm species that has evolved to live in its intestines. His studies of Trichina, the cause of trichinosis was used by Rudolf Virchow's campaign for meat inspection laws in Germany. With Virchow and Friedrich Albert von Zenker, he was the first to document the life cycle of Trichnella spiralis. For his work on parasites Leuckart is known as the father of parasitology. He also studied insects, documenting the anatomy and life cycle of the honey bee and the life cycle of Hippoboscoidea, (called Pupipara at the time) a super-family of obligate blood parasites that includes tsetse flies and bat flies. In 1861 he was named a privy councilor by the King of Saxony and was awarded an honorary PhD by University of Giessen. In 1869 he moved to the University of Leipzig. At first the facilities were inadequate, but in 1880 a zoological institute was built according to his specifications. It quickly became a center for zoological learning and attracted students from around the world. While at Giessen he created a series of zoological posters showing species of invertebrates that have been used world wide as teaching aids. Leuckart's magnum opus, a two volume work on human parasites and the diseases they cause remained unfinished at the time of his death but was still widely used by students of parisitology. Leuckart died in Leipzig on February 6, 1898.